Europe is a continent with countries closely knit together. It’s also a continent with high diversity of culture. Half of the countries on the top 10 list of smallest countries are located in Europe. 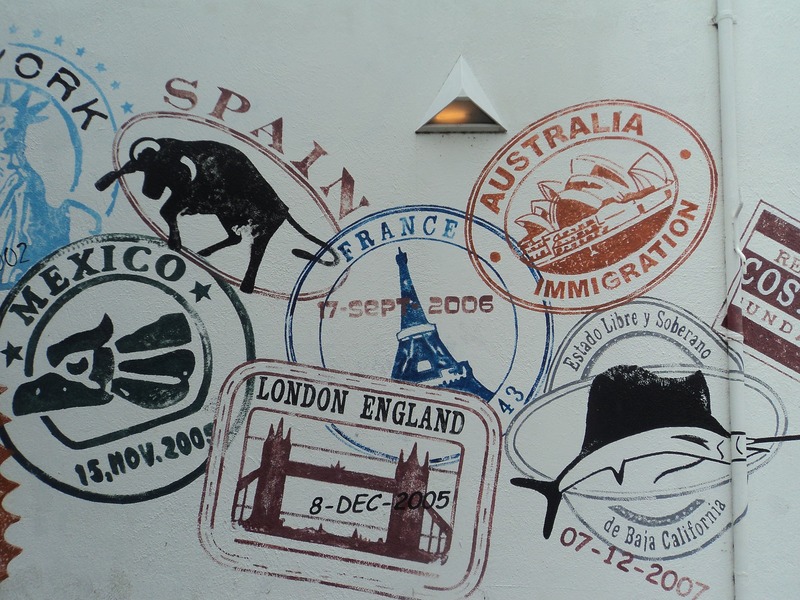 It’s easy to hop from one border to another, but when you’re short on time, you might want to maximise your time and visit multiple countries in 1 day. This way you get several cultural experiences in a short time frame. In the Netherlands, they even made a tourist attraction of it. You can visit 3 countries in less than 5 minutes and stand at the highest point in the Netherlands. Can you imagine crossing all those items of your bucket list? I couldn’t. But when my birthday was coming up I didn’t have the time to plan something epic. I’d love to fly to Istanbul or set sail for Antarctica on my birthday. But that wasn’t going to happen. On a whim, we decided to head to Vaals in Limburg, the Netherlands, where the borders of Germany, Belgium and the Netherlands form the 3 country landmark. Located in the South East of the Netherlands, the province Limburg stretches out towards Belgium and Germany. The Mount of Vaals (Vaalserberg) is 322.7 metres (1,059 ft) tall, making it the highest point in the Netherlands. Oh the irony. My little country is known for its flatness and even famous for having parts of the country below sea level. And there I was, on my birthday: the highest point in the Netherlands. Yeah! It sure was a conquest. 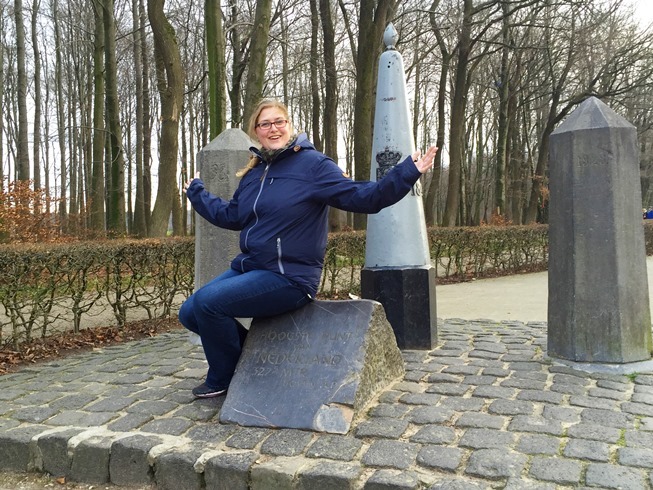 If you walk a few steps further you reach the 3 border point where the flags of the Netherlands, Germany and Belgium are planted and you’ll see the border stone. Do not expect to see any border patrol here. If it wasn’t for the markings on the floor, you’d never known you’d passed the border. The 3 country point is known as Drielandenpunt in Dutch, or Dreiländereck in German, or Trois Frontières in French. Between 1830 and 1919 your could actually stand in 4 countries at the same time. The point was actually a 4 border landmark, adding Neutral Moresnet as the 4th. Neutral Moresnet was a small piece of Belgium- Prussian piece of neutral land. The Dutch road leading to the point is actually still called four border road, to remind of this situation from the past. What to do at 3 Countries Point? To be honest, I didn’t expect much to see or do once we got to the point. It was just a small gimmick to visit multiple countries in 1 day. But I must say, I was surprised. We parked the car a little down the hill and walked up the hill. Here we encountered the first border stones. 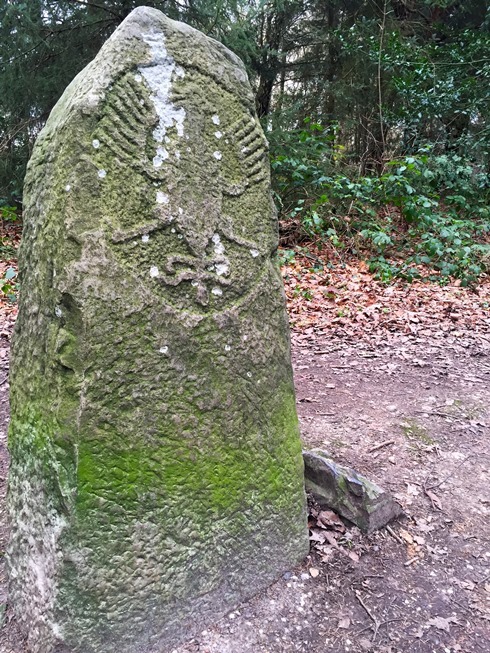 These stones from around 1340 CE depict the German eagle and are scattered across the forest of Aachen. So you first walk a bit through Germany, then you’ll reach the Netherlands again and bump into the Wilhelmina tower. There is a restaurant and you can go up this tower. But this isn’t the actual point yet. You follow the previously mentioned 4 border road which leads to the actual 3 countries point. Here there are parking spaces (paid, €2 per day) and you can get some snacks, ice cream or drinks. 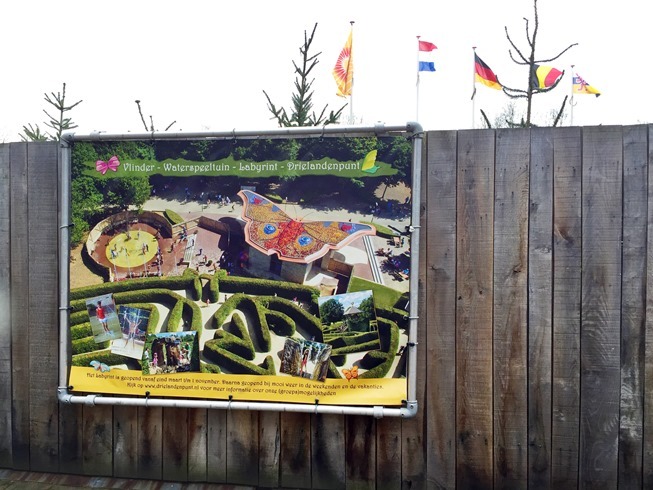 For the children (and adults) there is a maze, which is supposed to be the largest maze in Europe. Of course you can shop for souvenirs but the main attractions are the highest point of the Netherlands and the border stone from 1928. Here the 3 flags are posted and everybody wants to have their picture taken. On the Belgium side, you can climb the Boudewijn Tower which gives you sweeping vistas over Germany, Belgium and the Netherlands. 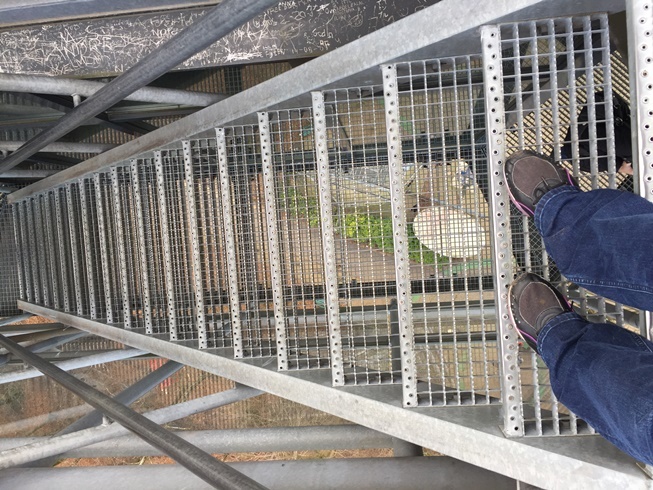 Both the Belgium and the Dutch towers have an elevator but it’s still scary to climb the tower as you can see through the floor. Scary moments there. The mount of Vaals is famous among cyclist. With its steepest km being 9% it’s the best spot to train your cycling skills in the Netherlands. All the roads leading up the hill are paved with bicycle paths. Around the mount of Vaals are multiple hiking routes marked. There is a long distance walking path, LAW 11 Pelgrimspad going from the Netherlands to Belgium and a shorter regional path (Krijtlandpad). Both are marked with the international symbols of the long distance walking paths. There also some shorter routes ranching from 2km to 4,5 km. For every level of fitness and duration is a suitable walking route. As mentioned before, you can just drive up the hill and park a few meters away from the 3 countries point. There are several car parks available where you can park your car all day for €2. If you don’t feel like walking, cycling or driving to the 3 countries point, you can also take the bus. The ride from the German city of Aachen to the border landmark is included in Aachens hop-on/hop-off bus tour. You can also travel by train from Maastricht train station via local bus to the nearest bus stop and walk a few meters to the border point. After we got down from the tower and planted our feet firmly on the ground again, I got to a little brain storming. I felt the Dutch part of the 3 countries point really tried hard to be a tourist attraction. There was an information booth, some benches and facilities to have lunch, snacks and diner. Obviously there were people from Germany, Belgium and the Netherlands walking around. But also some Chinese people and a Japanese couple got their picture taken at the border monument. Very international indeed. But I couldn’t help it but let my imagination run wild. I imagined a little post office, where 3 postal officials from Germany, Belgium and the Netherlands could stamp your postcard with stamps from each of the countries. Or customs officials who can stamp your passport and you could have multiple stamps in your passport for visiting the sight. Or you can only pay with a special Euro coin which represents all three countries. Well, who knows? Maybe if you visit the place in 10 years from now, you’ll have all these options available to you. I’m sure somebody could make a nice buck from it! The 3 countries border point of the Netherlands, Germany and Belgium isn’t unique in the world. Everywhere where there are multiple borders, you’ll find 3 countries points. Some well hidden in a vast mountain range, while others are marked with a border stone or an actual border. Half of the international tri-points are situated in lakes, rivers or oceans. In case you want to visit multiple countries in 1 day somewhere else in the world: I did some research. The most northern international tri-point in the world is located in a lake, bordering Norway, Sweden and Finland. The countries erected a Three-Country Cairn in the lake where the borders meet. The point is called Treriksroset. The signing of the Schengen Agreement took place on a boat, in the river, as that was the exact location of the border between Germany, France and Luxembourg. Ironically, the signing of the agreement made it possible to travel without border control among the members of the Schengen Zone in Europe. In a way, it made it possible to visit multiple countries in 1 day, without the hassle of borders. It’s also possible to have an international tripoint within the capital of a country. Bratislava has this unique feature as it’s the only capital in the world where you can visit multiple countries in 1 day. Slovakia, Hungary and Austria share their border in the rivers. The triple frontier, bordering Brazil, Argentina and Paraguay is where the rivers Iguazú and Paraná meet. It’s an area which attracts many visitors with the Iguazú falls and the area has been used in some movies and TV-shows. Where can you stand in 4 countries at once? Is there a thing like an international quadri-point? So you can visit 4 countries in 1 day? Unfortunately, there is not. Africa claimed to have the only quadri-point between nations but the borders of Namibia, Botswana, Zambia and Zimbabwe are actually multiple tri-points. The actual borders are just a few 100 meters away to be a legit 4 countries point. As mentioned before, the point at Mount Vaals used to be a quadri-point until 1920 when the neutral Moresnet was divided and the borders settled on the current situation. Although there are no international quadri-points, these 4-way points do exist within countries and nations. In the United States there is the Four Corners Monument where the states of Colorado, Utah, New Mexico and Arizona meet at 90 degree angles. 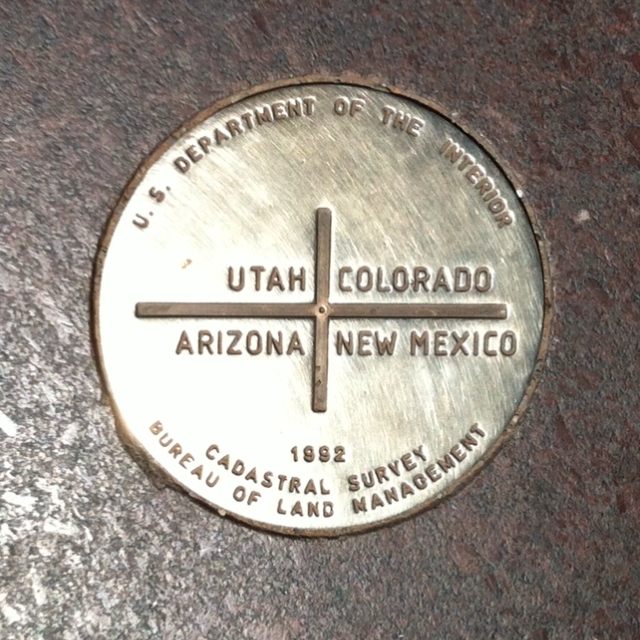 “Four Corners Monument Marker 2012” by Struhs – Licensed under CC0 via Commons. I do not advice to rush between countries to see as much as possible. But visiting a 3 countries point is a fun way to visit multiple countries in 1 day. As long as you make up for it and also visit the countries properly, it’s a great day out. Did you ever visit multiple countries in 1 day? Did you go to a 3 countries point or did you find another way? Please let me know.